Stalag 17B was situated 100 meters northwest of the village of Gniexendorf. This village is located six kilometers northwest of Krems, Austria (48-27N – 15-39 E). The surrounding area was populated mostly by peasants who raised cattle and did truck farming. 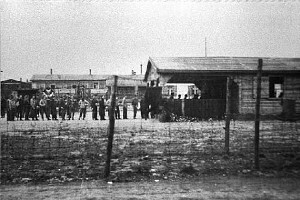 The camp itself was in use as a concentration camp from 1938 until 1940, when it began receiving French and Poles as the first PWs. 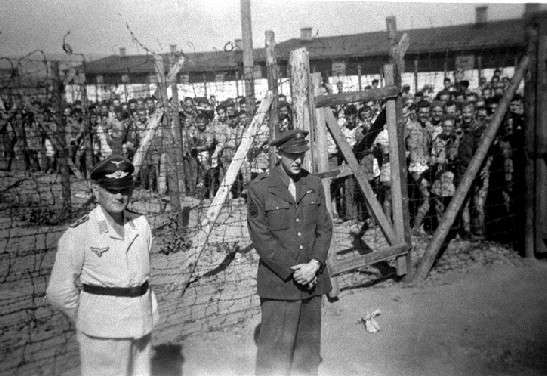 On 13 October 1943, 1350 non-commissioned officers of the Air Force were transferred from Stalag 7A to Stalag 17B, which already contained PWs from France, Italy, Russia, Yugoslavia and various smaller nations. At the time of the first Protecting Power visit on 12 January 1944, the strength had increased to 2667. From then until the last days of the war, a constant stream of NCOs arrived from Dulag Luft and strength reached 4237 in spite of protestations to the detaining Power about the over crowed conditions. 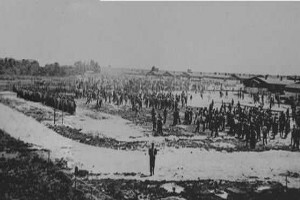 The entire camp contained 29,794 prisoners of war of various nations. The Americans occupied five compounds, each of which measured 175 yards by 75 yards and contained four double barracks 100 by 240 feet. The barracks were built to accommodate 240 men, but at least 4000 men were crowded into them after the first three months of occupancy. Each double barrack contained a washroom of six basins in the center of the building. The beds in the barracks were triple decked, and each tier had four compartments with one man to a compartment, making a total of 12 men in each group. Each single barrack had a stove to supply heat and cooking facilities for approximately 200 men. The fuel ration for the week was 54 pounds of coal. 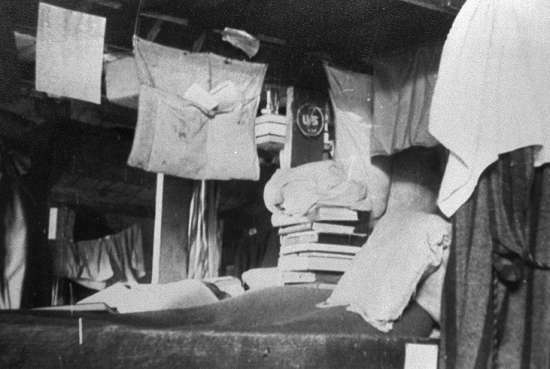 Because of the lack of heating and an insufficient number of blankets, the men slept two to a bunk for added warmth. Lighting facilities were very poor, and many light bulbs were missing at all times. Aside from the nine double barracks used for housing purposes, one barrack was reserved for the infirmary and the medical personnel’s quarters. Half a barracks was the library, another half for the MOC and his staff, and half for the theater, a half for food distribution and a half for Red Cross food distribution and a half for the meeting room. In addition, one barrack was used as a repair shop for shoes and clothing. 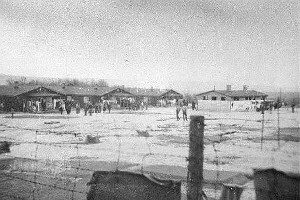 Four additional barracks were added in early 1944, but two other were torn down because they were considered by the Germans to be too close to the fence, thus making it possible for PWs to build tunnels for escape purposes. One of these buildings had been used a s a gymnasium, and the other chapel. Latrines were open pit type and were situated away from the barracks. Two separate wire fences charges with electricity surrounded the area and four watchtowers equipped with machine guns were placed at strategic points. At night streetlights were used in addition to the searchlights from the guard towers to illuminate the area. Staff Sgt. 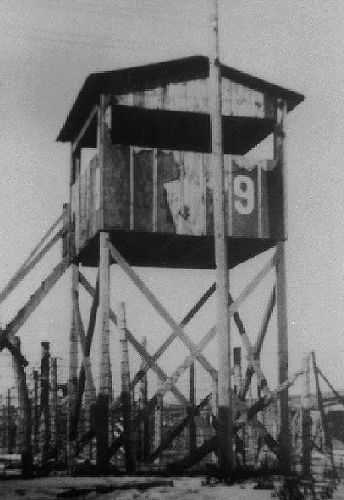 Kenneth J. Kurtenbach was MOC from the opening of the camp until its evacuation. Major Fred Beaumont was the SAO and the medical officer, but took no active part in their camp organization. Capt. Stephen W. Kane was the only chaplain and acted in an advisory capacity whenever called upon. There also existed a security committee. Sgt. Kurtenbach carried on the administration with the following organization. The blame for the bad conditions, which existed at this camp, had been placed on Oberst Kuhn who was both unreasonable and uncooperative. Four months elapsed after the opening of the compound before the MOC was granted an interview with the Commandant to register protests, and weeks would pass before written requests were acknowledged. Frequently, orders would be issued to the MOC verbally and would never be confirmed in writing. Some cooperation was obtained from Major Eigl, but since there was friction between him and the other German officers (who were Wehrmacht), his authority was extremely limited. 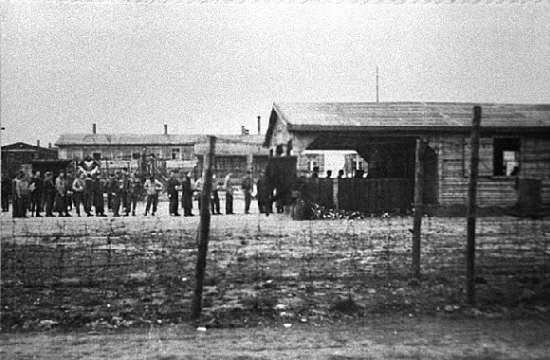 The treatment at Stalag 17B was never considered good, and was at times even brutal. 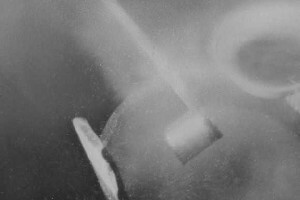 An example of extreme brutality occurred in early 1944. Two men attempting to escape were discovered in an out of bounds area. The PWs depended a great deal on card games, checkers, chess and other indoor games, as well as reading material from the well-stocked library. A complete public address system with speakers in each barrack inspired the organization of a "radio station" (WPBS) which furnished scheduled programs of music and information. Sgt. Haddon was assisted by a staff composed of instructors, librarians, a secretary, and office help. Classes in Mathematics, Laws Photography, Music, Economics, American History, Shorthand, Auto Mechanics, English, Spanish, German and French were given to the students. The school was held in a building containing the fiction and technical libraries. Six separate classrooms accommodating 40 men were used for instruction, and furniture consisted of benches, tables and blackboards. Because the limited supply of technical books prevented a check-out system, tables and benches were furnished for reference work. Interests, which were not handled in the scheduled classes named above, were provided for in evening discussion groups. These were usually journalism, farm management and livestock farming, and were directed by men who had had successful experience in the fields. These evening discussion groups were particularly popular during the spring and summer months when they could be held outdoors after the supper hour. When the school was first started, attendance registered 1389, but gradually enthusiasm dropped until the average attendance was 980. This was the average attendance figure during the school's operation. 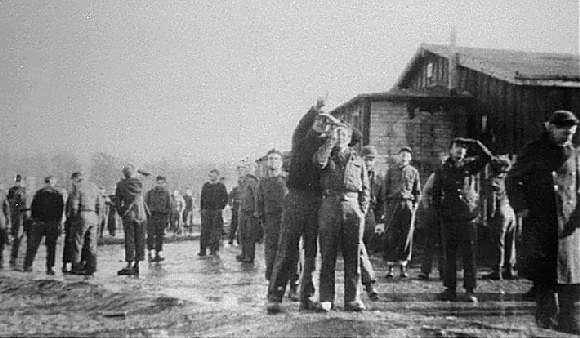 On 8 April 1945, 4000 of the PWs at Stalag 17B began an 18-day march of 281 miles to Braunau, Austria. The remaining 900 men were too ill to make the march and were left behind in the hospitals. These men were liberated on 9 May 1945 by the Russians. The marching column was divided into eight groups of 500 with an American leader in charge of each group, guarded by about 20 German Volkssturm guards and two dogs. Red Gross parcels were issued to each man in sufficient amounts to last about seven days. During the 18-day march, the column averaged 20 kilometers each day. At the end of the day, they were forced to bivouac in open fields, regardless of the weather. On three occasions the men were quartered in cow barns. 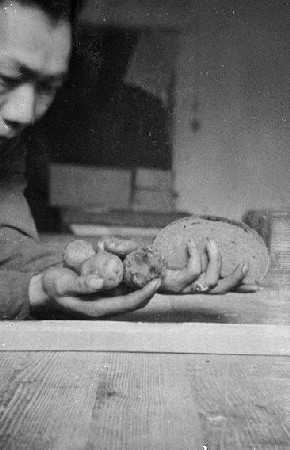 The only food furnished to PWs by the German authorities was barley soup and bread. 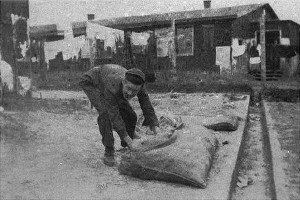 Trading with the German and Austrian civilians became the main source of sustenance after the Rod Cross parcel supplies were exhausted. The destination of the column was a Russian prison camp 4 kilometers north of Braunau. 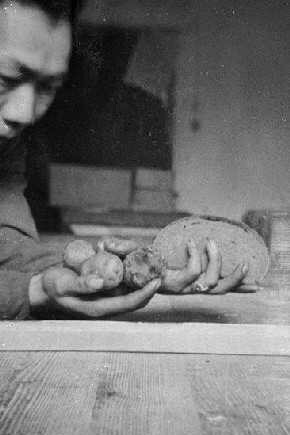 Upon arrival, the PWs cut down pine trees and made small huts, since there was no housing available. Roaming guards patrolled the area and the woods surrounding the area, but no escape attempts were made because it was apparent that the liberation forces were in the immediate vicinity. 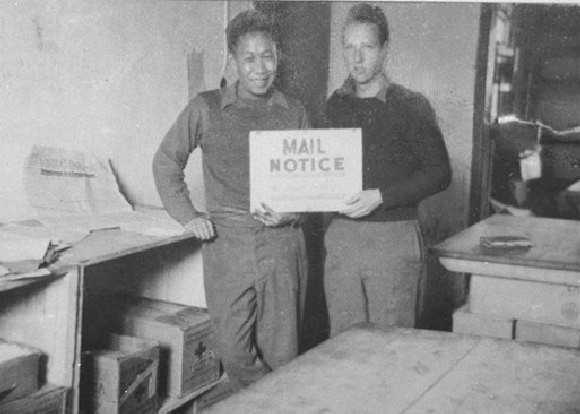 The day after their arrival at the new site, Red Cross parcels were issued to every PW. A second issue was made a few days later of one parcel for every fifth man. 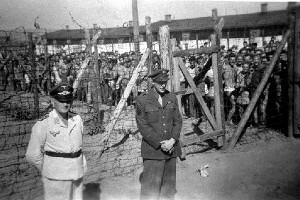 On 3 may 1945 the camp was liberated when six men of the 13th Armored Division arrived in three Jeeps and easily captured the remaining guards who numbered 205. Other units of the 13th Armored followed shortly and organized the evacuation of the PWs by C-47 to France on 9 May 1945. The prisoners regret they are not in an Air Force camp. They consider that they are entitled to a special camp and the privileges of aviators. 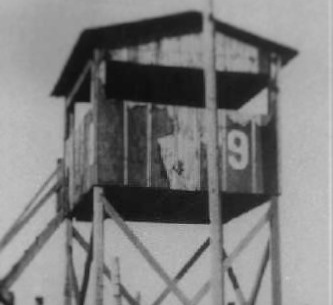 The part of the camp where they are is under the command of an air force Captain, but he cannot act fully and receives orders from the authorities of the Stalag. IRCC 1-12-44. While no serious incident has occurred, prisoners are treated badly by certain guards. They have been threatened and some struck with gun butts and badly bruised. Spokesman stated that attitude of the guards is often influenced by bombardments. Commandant stated that no complaint had yet reached him, but that he would take steps to remove guards unsuited to their work. Prisoners protested vigorously being forced to fill up discovered escape tunnels. This is because as NCOs, they may not be forced to work and they considered this work as aiding the enemy. PP. 8540 5-31-44. All mail goes through Stalag Luft 3 and the delay is considerable. Incoming mail takes 5 months. PP 7034 12-7-44. Many men captured a year ago have received no mail. Outgoing mail very erratic. Letterforms issued in order. PP 3-15-44. 24 cold water taps per wash room. Insufficient water from 6:30 to 8:00 AM and 10:30 to 12:00 and 4:00 to 6:00 PM. No hot water. Only 1 hot shower during the last two months. 4 latrine houses… pits are emptied every two or three weeks. There is a very bad smell partly due to the fact that the men burnt the lids as fuel. The Commandant promised to have the pits cleaned more often and provide more disinfectant. PP visit 7034 12-7-43. No change in bathing facilities. Entire camp has had one bath at central bathing station since May 30. The outside latrines are not used at night and the small latrines at the end of the barracks are in bad shape. PP 8696 6-16-44. 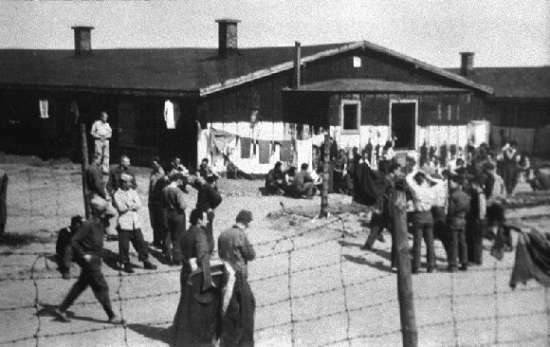 Delegate lodged a protest to Kommandant in view of the repeated entries of civilian agents on the Gheime Staatspolizei (known as Gestapo) into the American compound. These agents have searched prisoners and barracks and have confiscated any food, tobacco or personnel belongings which prisoners may have possessed in excess of limits allowed. These agents appear particularly keen at confiscating American LogBooks. Commandant explained apparently with regret, that he was unable to alter this situation. He drew attention to the fact that the Gestapo has become an integral part of the Wehrmacht since the Reichfuhrer SS has taken over the Supreme command of the Erstazheer. PP 11018 1- (17-19)-45.